In conjunction with the Biggest Loser, Bridget Sinnott and Mairead Roche have offered to carry out a blood pressure test for anyone interested. Please call to the GAA Complex on Thursday evening between 7.30 and 9.00 pm to avail of this service. Biggest Loser teams have been finalized and all members weighed. Da Killers (31 members and Team weight 2604.5kg, Average 84kg) – Podge Stafford, Lisa Stafford, Ger Daly, Chris Daly, Laura Daly, Anna Mae Daly, Paul Bolger, John Bolger, Michelle martin, Barry Millar, Liam Dunbar,Tom Nolan, James Donohoe, Larry Carthy, Noel Winters, Micheal Stafford, Clare Doyle, Gillian Murphy, Anna Martin, Helen Murphy,Ann Stafford, Annette Rowsome, Frances Murphy, Frank Ennet, Bill Rigley, Cathy Rigley, Joan Dunbar, Mackenzie Jones, Josh Rigley ,Valarie Rigley,Sinead McGlynn. Kilcormac Crushers (26 members and Team Weight 2291.60kg, Average 88kg) – Niall Finn, Aidan Finn, Beibhinn Finn, Henny Leary, Paul Ashe, Noeline Finn, Kathleen Kehoe, Niamh Kehoe, Declan Kelly, Christy Whelan, Liam Gahan, Mark Gahan, Jonathon Dunne, Adrian O Dowd, Aileen Dempsey, Olive Burke, Graham O Reilly, Billy Whelan, Ann Whelan, Mairead Carty, Eleanor Rossiter, Ann Marie Hennessy, Cormac Finn, Eugene Dempsey, Charmaine Kehoe, Carmel Gahan. Coolgarrow (12 members and Team Weight 912.60kg, Average 76kg) – Denis Walsh, Lara McCann, Ellen Doyle, Sarah Darcy, Aoife Lenihan, Eugene Corrigan, Gillian Corrigan, Annette Cashe, James Walshe, Marie Kinsella, John McWey, Joy McWey. Tinnacross Rebels (29 members and Team Weight 2338.60kgs, Average 81kg) – Orla Gahan, Fiona Gahan, Ciara Gahan, Josie Gahan, Stephen Power, Eileen Nolan, Mgt Donohoe, John Donohoe, Jim Gahan, Bridget Sinnott, Marie Cunniffe, Padraig Cunniffe, Carol O Connor, Ted Nolan, Eileen Roche, Alma Donohoe, Joe O Reilly, Peter Breen, Siona Nolan, Mag Breen, Marese O Connor, Ciaran Roche, Linda Conway, Micheal Somers, Padraig Sinnott, Paul Donohoe, Conaill Nolan, Tom Bossy Nolan, Ted Roche. Tempermental Superstars – Knocknaskeaugh/Knockavocca (23 members and Team Weight 1842 kg, Average 80kg) – Padraig Denton, Daire Turner, Nicola Turner, Barry Turner, James Sweeney, Mick Sweeney, Martin Sweeney, Yvonne Sweeney, Sammy Greene, Dermot Breen, Fiona Turner, Stephen Lacey, Aoife Lacey, Breda Sweeney, Caroline Farrington, Paula Lacey, MJ Rossiter, Tanya Kehoe, James O Loughlin, Marie O Loughlin, Anthony Dempsey, John O Loughlin, Lorraine Dempsey. Crane Cheetahs – (28 members and Team Weight 2453 kgs, Average 88kg) – Tom Breen, Deirdre Breen, Robbie Breen, David Breen, Mary Breen, Tommy Breen, Rose Breen, Martin Breen, Patrick Breen, Niamh Breen, Austin Codd, Joanne Codd, Colm O Loughlin, Rosemary O Loughlin, Martina Murphy, Stephen Murphy, Dolores Cousins, Antoinette Murphy, Peter Nolan, Liz Somers, Kathleen Redmond, Niamh Redmond, Claire Murphy, Catherine O Brien, Kathleen Murphy, Brenda Murphy, Bernie Murphy, Anne Butler. The Hurt Knockers – Knockduff (28 members and Team Weight 2389.90 kg,Average 85kg) – John Carton, Mary Carton, Jimmy Duck Gahan, Geraldine Gahan, James Gahan, Mary Gahan, Mick Murphy, Marie Moore, Michael Rowsome, Audrey Rowsome, Keith Swaine, Kelly Swaine, Bryan Dwyer, Kathleen Dwyer, John Dwyer, Damien Donnelly, JC Breen, Anthony Guinan, Pat McDonald, Alice McDonald, John Dolan, Sean Murphy, Bernadette Carton, Steve Graham, Des Gahan, Bryan Dwyer Jnr, Jim Donohoe, Mick Goff. Tomsollagh – (19 members and Team Weight 1528 kgs, Average 80kg) – Se O Brien, Ed Rowsome, Catherine O Brien, Ray O Brien, Jamie O Brien, John Foley, Joe Hayes, Mick Nolan, Frank Kehoe, Anne Kehoe, Shane Kehoe, Matt Stafford, Orla Stafford, Laura Donnolly, Mary Breen, Katie Breen, Niamh Kehoe, Nuria Nolan, Tara O Brien. Ballysimon (34 members and Team Weight 2802.5 kgs, Average 82kg) – Aidan Fenlon, Eleanor Fenlon, Damien Fenlon, Niamh Stafford, Ciaran Fenlon, Aoife Nolan, Billy Gahan, Bertha Gahan, Liam Gahan, Paul Gahan, Bertie Gahan, Conaill Cooper, Alan Murphy, Paudie Cooney, John McCabe, Rita McCabe, Sean McCabe, Michael Kelly, Fran Fenlon, Nancy Fenlon, Larry Murphy, Eithne Murphy, Ruth Rooney, Chloe Rooney, Marie Stokes, Becka Stokes, Mary Canavan, Danielle Kerslake, Nicola Denton, Emma Stokes, Leah Fenlon, Dermot Pendergast, Micheal Gahan, Dean Fenlon. Thin to Win – Carrigeen & Ballycarrigeen (32 members and Team Weight 2876.70 kgs, Average 89kg) – Stephen Fitzgerald, Claire Roche, Denis Fitzgerald, Jonathon Fitzgerald, Joe Fitzgerald, Bridget O Loughlin, Niall O Loughlin, Sean Doran, Laura Johnson, Adrian O Loughlin, Nikki Daly, Paddy Doran, Oleen Doran, Ian Rochford, Jimmy Shugs Gahan, Morgan Gahan, Donny Walsh, Cormac O Loughlin, Mick Flood, Clodagh Gregan, Aidan Gamers Gahan, Martin McFadden, Philip Gahan, Orla McFadden, Mag Ellix, Brian O Loughlin, John Fenlon, Daire Walsh, Mark Ellix, Chanel Walsh, Murt Walsh, Lorraine Gahan. Cool Kat Killers – Kilpierce – (15 members and Team Weight 1249 kgs, Average 83kg) – Julie Dunne, Anne Allen, Michelle Allen, Aidan Allen, Paul Doran, Anthony Dunne, Jonathon Dunne, Christopher Squance, James Squance, Paul Whelan, Georgina Whelan, Patricia Doran, Majella Wall, Carol Walsh, Tracey Squance. Ballymotey – (26 members and Team Weight 2088 kgs, Average 80kg) – Stephen O Leary, Eleanor Hawkins, Ray Kehoe, Andy Thomas, Leo DeLacy, Martina O Sullivan, Josephine O Sullivan, Derek Gibson, Paul Gibbons, Ian Hawkins, Mervyn Hawkins, Peter Mernagh, Jean Mernagh, Bill Houlihan, Mark O Brien, Rachael Shortall, Emma Mernagh, Sean Mernagh, Margaret Collier, Sabrina Collier, Derek Collier, Maurice Taylor, Ciara McBride, Emma O Dowd, Sean O Dowd, Sinead Gahan. Murtagh Warriors – Ballymurtagh (21 members and Team Weight 1782.7 kgs, Average 85kg) – Andy Fenlon, John Fenlon, Paul Fenlon, Anne Fenlon, Rita Fenlon, Kevin Murphy, James Kehoe, Suzie Kehoe, Karen Kelly, Michelle Kennedy, Oliver Kennedy, John Quigley, Sean Roche, Ray Fenlon, Agnes McHale, Anne Marie Walshe, Graham Walshe, Anne O Sullivan, Noel Butler, Jane Murphy, Derbhla McCabe. are not on a team you can register on the day and pay 10 euro. Registration begins at 1pm in Monageer. The Biggest Loser Fun Cycle will be held on the 16th February at 2pm. The long route is The Harrow, Tinnacross, Ballyhuskard, Oulart, Clone West, Tomnaboley Lower and finishing back in The Harrow. If you fancy a fun cycle but are not on a team you can register on the day and pay 10 euro. Registration begins at 1pm in the Harrow. The Biggest Loser Fun Cycle will be held on the 16th February at 2pm. The short route is The Harrow, Tinnacross, Ballymotey Beg, Grange, Tomnaboley Lower and finishing back in The Harrow. 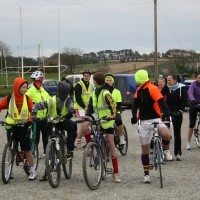 If you fancy a fun cycle but are not on a team you can register on the day and pay 10 euro. Registration begins at 1pm in the Harrow. On Friday night the 10th January we launched our Biggest Loser Competition. 276 people weighed in on the night and are divided into 13 teams. Over the weekend another 39 weighed in. Entries have now closed for the competition and training has started. The teams are as follows: Tomsollagh, Da Killers, Tinnacross Rebels, Tempermental Superstars, Crane Cheetahs, Thin to Win, Cool Kat Killers, Ballymotey, Murtagh Warriors, The Hurt Knockers, Ballysimon, Kilcormac Crushers and Coolgarrow. The first part of the competition is the Cross Country (Bog Run) on Jim Gahan’s land in Tinnacross. This takes place on Sunday 2nd February at 2.00pm. A mobile phone was lost on the walking track this evening. If found please phone Denis on 0874101025. Thank you.